Gah, I can’t shake some horrible congestion. I thought paleo is the magic cure-all and I wouldn’t be getting sick anymore! Despite having one nostril clogged at all times, I did really well yesterday back on the paleo wagon. my legs were shaky just walking out of the gym, whoo! 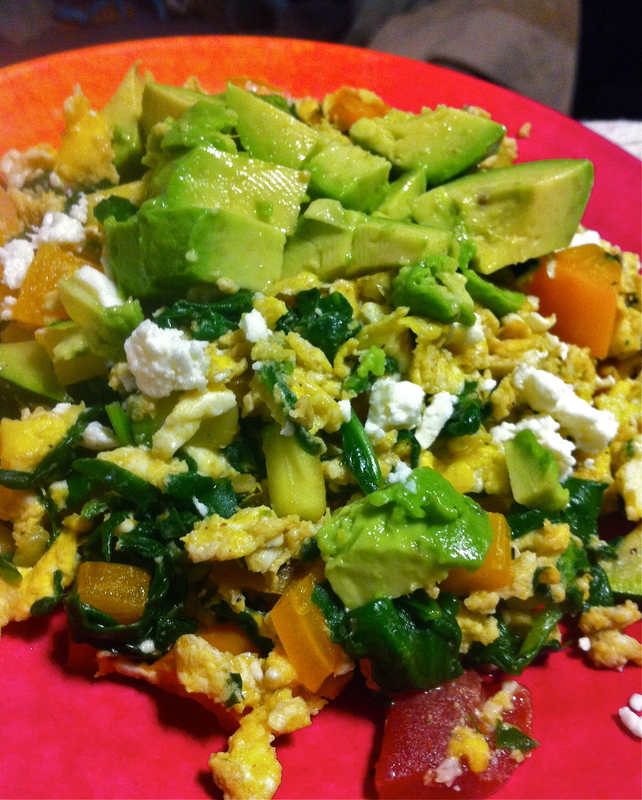 Breakfast: egg scramble w/ zucchini, bell bebopper, spinach, salsa, avocado, and a sprinkling of feta. So good, and soooo filling. I had a snack of pineapple and strawberries in between classes. I was super hungry when I got home though, so I whipped up lunch. Cabbage must have super powers because it’s been half cut up in my fridge for a couple weeks and it’s still kickin. I stir fried it with coconut aminos, sesame oil, rice vinegar, and a dash of fish sauce and red pepper flakes. 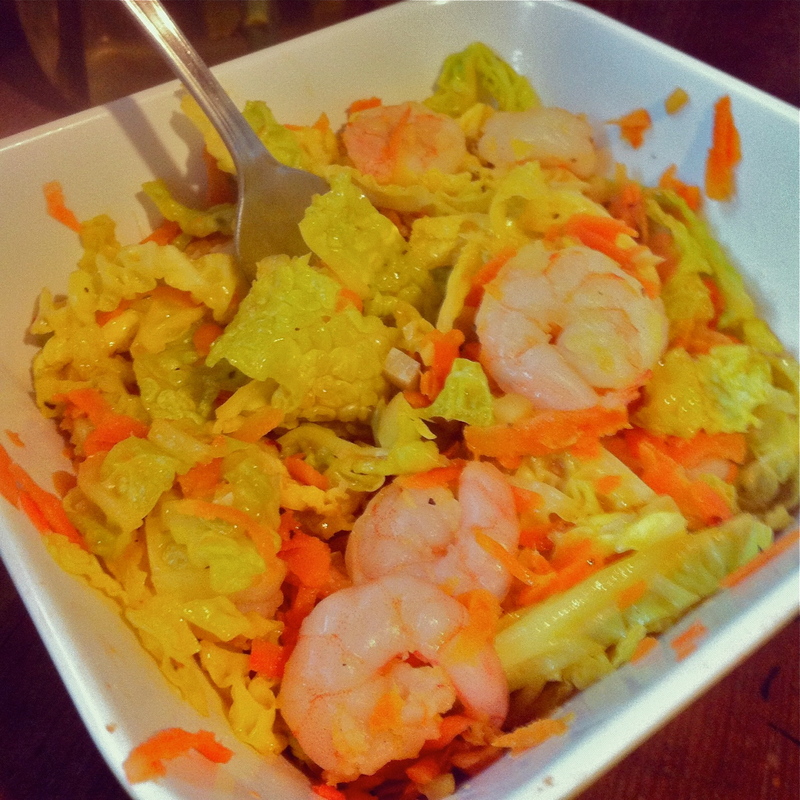 Instead of using sugar I grated in some carrots, and then cooked it up with some shrimp towards the end. This was delicious! Can’t wait to have leftovers for lunch today, sans shrimp. Nights I have group meetings and yoga at 7 always mess up my dinner schedule. I cooked a batch of mashed cauliflower and packed it to go with a trader joe’s garlic sausage. It was yummy, and kept me full till after yoga. 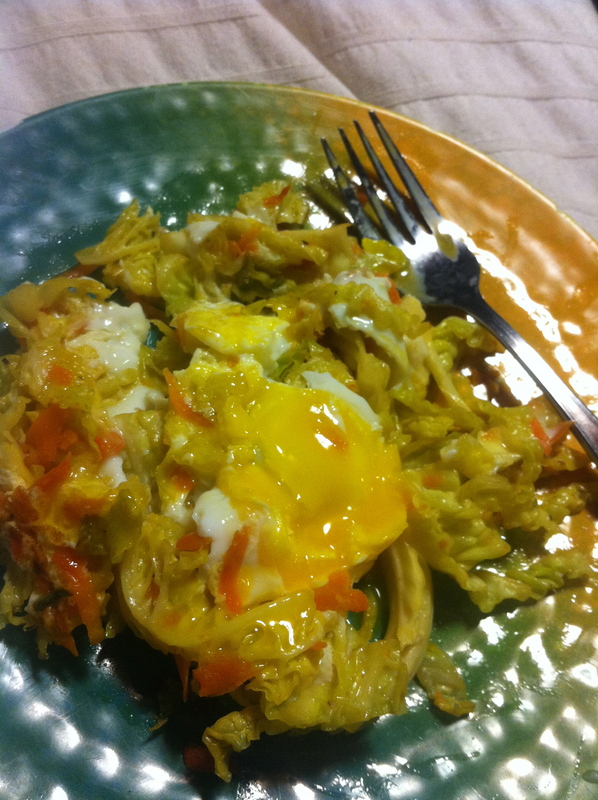 Once home, I heated up some cabbage and cooked a fried egg for some protein. Anyone else obsessed with yolky eggs like me? They BOMB! off to whip up dinner for tonight, it’s gonna be a loooooong day.